From left to right: Houxiang Zhang, Geir Hovland and Lars Ivar Hatledal in one of the simulator domes. 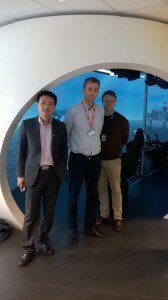 From left to right: Geir Hovland, Lars Ivar Hatledal and Houxiang Zhang in the open 3D simulator area available for teaching and research in the Mechatronics group at NTNU Aalesund. On October 16, 2017 a working meeting in WP4.3 Protocols and standards for integration of simulation models and co-simulation was held at NTNU Aalesund. 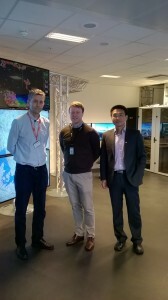 Lars Ivar Hatledal is the PhD candidate working in this work-package, Professor Houxiang Zhang is the principal supervisor while Arne Styve (not in the photos) and Geir Hovland are the co-supervisors. 09:00 – 11:30 Visit to the very impressive infrastructure and collection of 3D simulators available at NTNU Aalesund and their partner Offshore Simulator Centre (OSC). The simulators are used both in teaching, research and external projects with industry partners. 12:15 – 14:30 Presentation by Lars Ivar Hatledal and following discussions about the plans and project focus. WP4.3 is the first common research activity between the two Mechatronics groups at NTNU Aalesund and University of Agder, and is hopefully the beginning of a long-term collaboration.